Rexford is located deep in the timberlands of northwestern Montana, north of Libby along the Kootenai River and just seven miles south of the Canadian border and near Glacier National Park and Big Mountain Resort. The town was moved two miles from its original location when the 420-foot-high Libby Dam was built creating the 90-mile-long Lake Koocanusa. Lake Koocanusa cuts a narrow fjord-like gorge between the Purcell Mountains and the Salish Mountains. 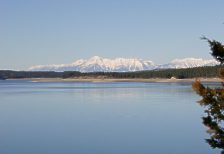 The lake provides excellent fishing and boating opportunities. Picnicking sites, overnight camping, ball fields, a swimming beach, and boat ramps are available here as well as summer tours of Libby Dam, which is located approximately 43 miles south of Rexford at Lake Koocanusa. Lake Koocanusa Scenic Byway, in the Kootenai National Forest in northwestern Montana, follows the Kootenai River and Lake Koocanusa via State Highway No. 37. Open year-round, this 67-mile route connects Libby and Eureka, traveling right through Rexford. Rock outcrops and ledges provide habitat for bighorn sheep, seen frequently along the byway. Numerous hiking trails in the Kootenai National Forest intersect the byway and a 100-mile circular bicycle tour begins at Libby Dam. Rexford is also located near Ten Lake Scenic Area of the Kootenai National Forest, which offers more than 89 miles of trails of remote backpacking and hiking opportunities through rugged terrain with spectacular mountain views reaching into Canada. High alpine mountains, cool clear high mountain lakes, peaceful meandering trails, all combine to make Ten Lakes Scenic Area a backpacker's and angler�s delight.